QuickTap™ tapping tools get the job done quickly and effectively by tapping threaded holes directly in the punch press. QuickTap™ tools can tap up to 200 holes per minute while preventing time-consuming secondary operations. Tapping tools are manufactured and serviced with the speed and reliability of Wilson Tool International. 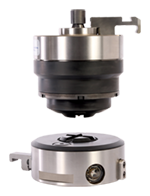 QuickTap™ tapping tools are available for Thick Turret, Strippit PX and Euromac machines. Want a fast tapping tool you can rely on? QuickTap™ delivers blazing speed and dependability. Boost productivity up to 200 taps per minute, and get Wilson Tool’s fast delivery, service and repair expertise. See the Thick Turret QuickTap™ in action. Take a look at this example cost comparison chart to see how much money you can save by hole tapping in your punch press vs. manually. There’s no denying the facts – it’ll pay for itself. Tapping Oil is a key feature, meant to help get the maximum tap life out of your QuickTap taps. Your QuickTap™ for Thick Turret style machines comes with all of the components you need to set up, run and maintain your tapping tool for top performance of up to 200 taps per minute. Your QuickTap™ for Euromac style machine comes with all the components you need to set up, run and maintain your tapping tool for top performance of up to 200 holes per minute. Your QuickTap™ for Strippit PX style machines comes with all the components you need to set up, run and maintain your tapping tool for top performance of up to 120 holes per minute. The Technically Speaking video series presents frequently requested topics in a straight-forward video format. In this episode, host Jason Esch provides a helpful walk-thru of adjustment and prepping the QuickTap tool for Thick Turret. The video shows how to change taps and pitch inserts, shim the tool and prime the pump. Racine Metal Fab has two priorities when it comes producing parts: get it out fast, have it done right. Speed and accuracy are top-of-mind for their team, so the QuickTap™ tool made a big impact on their production. Tapping is a very important part of many manufacturing operations. When the product isn’t working, the operation can slow down. Because of this, having a fast, reliable service provider is key. Wilson Tool offers best-in-class services for QuickTap™ tapping tools. Not all service needs are the same — service is based on your particular needs. Contact us today and our tooling technicians can help you customize your repair. 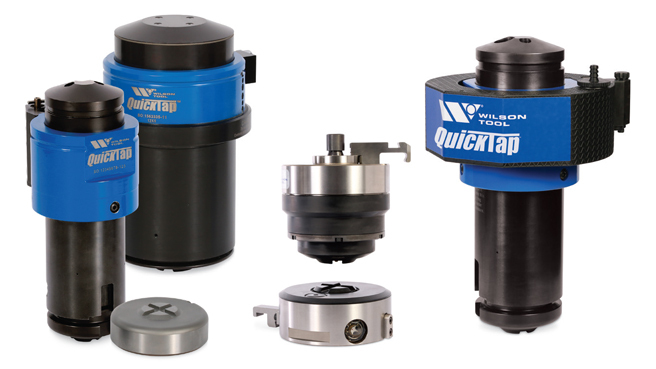 Wilson Tool International’s QuickTap™ is the fastest, most reliable tapping tool available on the market, allowing fabricators to eliminate time-consuming secondary operations. These thread tapping solutions provide top-quality service, speed and delivery for Thick Turret, Strippit PX and Euromac machines. 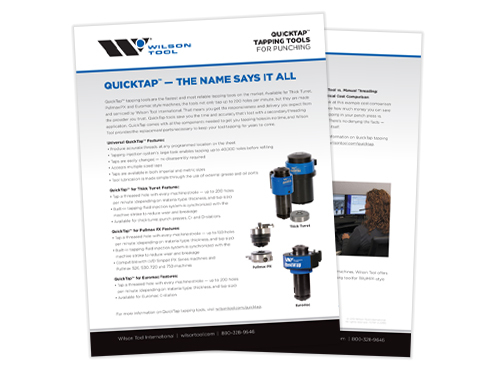 See this flyer to explore all the features and benefits of QuickTap™ tapping tools. Interested in a TRUMPF-style tapping tool? In addition to QuickTap™ for Thick Turret, Strippit PX and Euromac style machines, we also offer a highly efficient tapping tool for TRUMPF-style machines.